All about Rock and Roll, aka Rock n' Roll, or just plain Rock. The golden age of rock suffered a tremendous loss on February 3, 1959. Rock was still in its infancy when 3 of it’s biggest and most promising new stars were lost in a plane crash. The day has been immortalized as The Day the Music Died. Rock lost Buddy Holly, Ritchie Valens, and J. P. “The Big Bopper” Richardson. 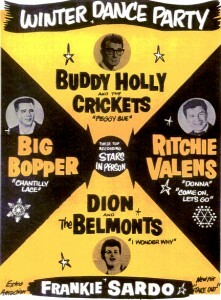 Buddy Holly was the star of the show. He already had 3 hit albums out. His Peggy Sue and Oh Boy had made the top 10 and That’ll Be The Day was a #1 hit. Ritchie Valens was a newcomer to rock recording. He released his first album barely 8 months before. Ritchie had a few hits including La Bamba. J. P.” Richardson, known best as “The Big Bopper” was a DJ and songwriter. J. P. wrote several songs that became #1 country hits for George Jones and Johnny Preston. The Winter Dance Party tour was planned to visit 24 midwest cities in only 3 weeks. Just about every night was a concert and every day was travel. It was winter in the midwest, the weather stank, and the tour bus had heater problems. Some of the band members caught the Flu and drummer Carl Bunch had to be hospitalized for frostbite on January 31st. It was a long way from the way that we pamper rock stars today. Their next date was February 1st in Green Bay, Wisconsin with Dion and the Belmont’s Carlo Mastrangelo filling in on drums for everyone. 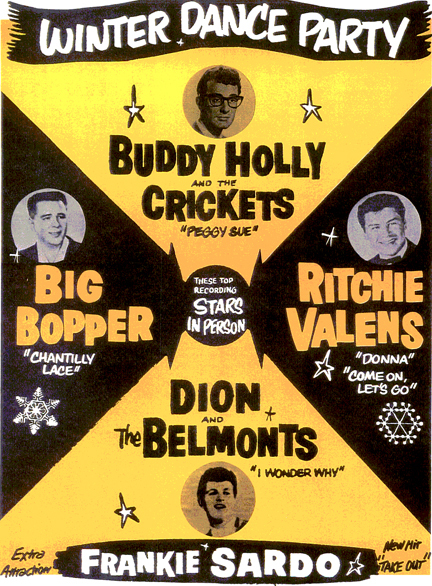 Richie Valens and Buddy Holly filled in on drums when Carlo was singing with the Belmonts. February 2nd brought them to the Surf Ballroom in Clear Lake, Iowa. Their next concert was in Moorhead, Minnesota, almost 400 miles away. Buddy Holly wanted to avoid the long trip on the unheated bus and arranged for a small charter plane. As the story goes, the plane had room for the pilot and only 3 others. Buddy Holly and J. P. Richardson claimed the first 2 sets, Dion DiMucci decided that the $36 share of the charter was too much and didn’t go, and that left Waylon Jennings and Ritchie Valens to fight over the remaining seat. They flipped a coin and Ritchie Valens got the seat. I can’t really say that he won because the plane crashed shortly after take off and all aboard were killed. The fateful day was given its historical name “The Day The Music Died” by Don McLean in his 1971 opus American Pie.